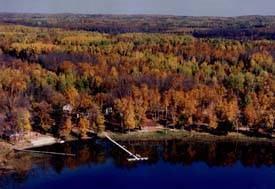 lakeshore on beautiful Moose Lake, 1200 acres. lakeside cabin on the resort, the choice is yours! Some rental offers fireplace, screen porches, and air conditioning. Primary fish include Walleye, Musky, Northern, Bass & Jumbo Perch. Bring your own boat or rent a Pontoon Boat or Fishing Boat. Canoe, paddleboats, and kayaks available for use at no additional cost on resort. Canoe available at lakehome for no additional cost. Bait, boat gas, and small gift shop cement BB court, volleball area, playground, and small gameroom available on resort . Firepits located in two primary areas on resort and private firepit with lawn chairs available at lakehome. This picture is taken from the lakeshore. Home includes central air, gas fireplace, dishwasher, fully equipped kitchen, and log furniture. 1 full bathroom. Sleeps 6-12. Lots of room. 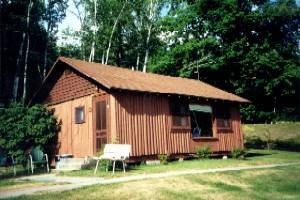 2 Bedroom Cabin with gas parlour stove, window air conditioner, log furniture, screen porch, and fully equipped kitchen. Sleep 4-6. 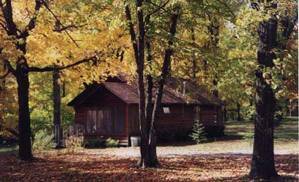 3 Bedroom lakeside cabin with fully equipped kitchen, picnic table and charcoal grill. Sleeps 6-8. 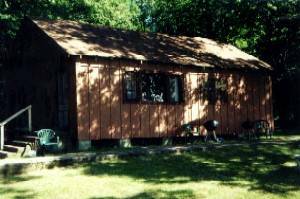 2 Bedroom lakeside cabin with fully equipped kitchen, picnic table, & charcoal grill. Sleeps 4-6. Wonderful swimming area for children. Lots of sand and room to roam without drop-offs. 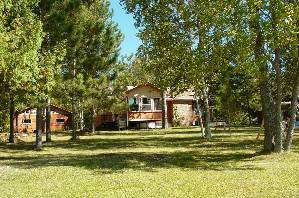 Includes 1200 feet of lake frontage. We are a family that has been enjoying this resort since 1987?,without missing a year, We started going with our parents and family, and now many years later are bringing our own children. 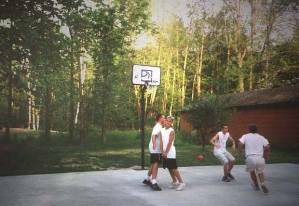 We have always enjoyed this resort and have never had a bad experience. The owners and other families that have been there from year to year,have now become very good friends and like a family to us now. Last year our son got his first legal muskie after his first year of trying, How exciting that was!!! Great Place to vacation, Not a resort to miss, Were hoping for many more years there, Tammy & Bill. 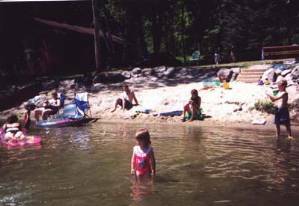 If you are looking for a fun gettaway place, Moose Lake Resort has everything that you will need. If you are going fishing, they have your bait, and if you are going up there for a fun time, they have many necessary supplies in the store. This will be our 7th year going up there, and we don't plan to stop. Once you go up there once, you will want to return year after year. You will have a great time in a wonderful, clean, and peaceful environment. Discounts made for monthly stays. Call for specials and value added days. Boat & Pontoon Rental Available. Cancellations and Refunds: Deposits are not refundable if part or all of your reservation is cancelled within 120 days of your arrival. If notice of cancellation is received more than 120 days prior to your stay, a $50 booking fee will be retained.